An absolutely fantastic lens, the 85mm G Master lens provides amazing quality, low-light performance, and outstanding Bokeh for the Sony E-mount camera system. Worth the money if you are looking for the best quality available. Read more in our Full Conclusion. Capitalizing on the success of Sony's Professional E-mount cameras, the Alpha 7 series, Sony has released a new set of "G Master" lenses. These lenses include the latest and fastest AF systems, highest quality glass elements, and all of the manual controls that you can ask for. The FE 85mm F1.4 GM lens is fantastic for Portrait Photography; producing incredibly sharp, high resolution images; and at the same time, outstandingly smooth and beautiful Bokeh provided by the 11-blade Aperture. The lens also features a focus lock button and aperture click on/off switch to accommodate all types of still photography and even smooth video exposure adjustments. 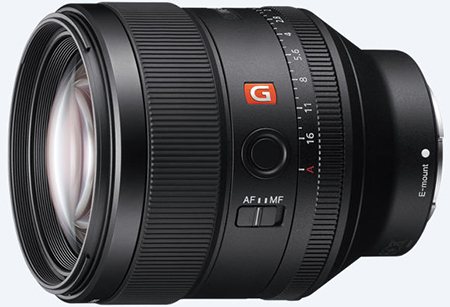 The Sony FE 85mm F1.4 GM lens is available now with a MSRP of US $1,799.99.